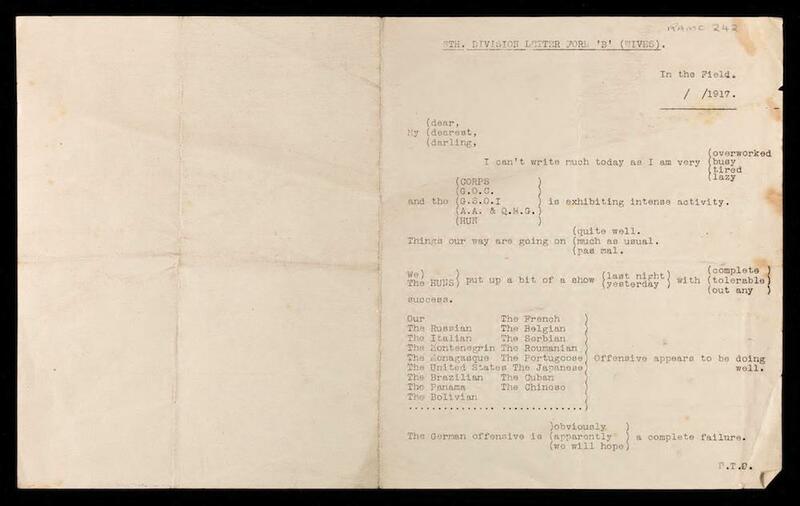 History of military censorship in World War I: Parody form letter home from the front. This wry form letter, found in the World War I diary of Captain Neil Cantlie of the British Royal Army Medical Corps, parodies the content of a typical letter to a wife, commenting on censorship restrictions as well as the inherent absurdity of trying to describe the situation on the front for those at home. The British Army used several forms of censorship during the war to try to control the flow of news from soldiers to their families. 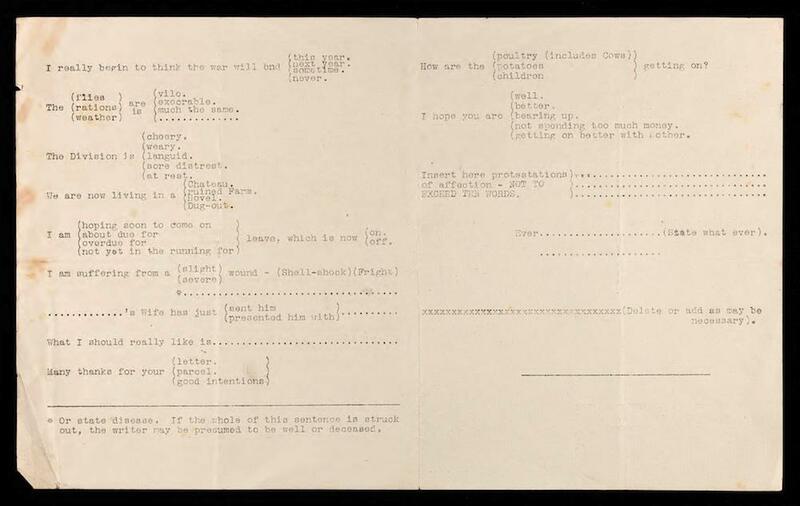 Pre-printed “field postcards” (like this one filled out by poet Wilfred Owen) restricted messages to the barest details. Soldiers would cross out the information that didn’t apply (“I have received no letter from you lately”), leaving the lines that did. In other instances, postal censors redacted forbidden information found in conventional missives, using scissors or ink. Other systems asked for self-censorship, with soldiers operating on the honor system, leaving out information that might damage homefront morale or undermine the Army’s strategic plans. This letter plays on these requirements of restriction, but the true darkness of its humor lies in its parody of the stilted questions a faraway soldier might ask a distant wife. “How are the (poultry [includes Cows]) (potatoes) (children) getting on?” one question wonders. “Insert here protestations of affection—NOT TO EXCEED TEN WORDS,” the form finishes. I first saw this letter in a post on the U.S. National Library of Medicine’s Circulating Now blog, introducing the N.L.M. and the Wellcome Library’s new WWI-related digital collections. Letter found in the war diary kept by Captain Neil Cantlie, RAMC, with the 6th Division at the Battle of the Somme, Sept.–Oct. 1916. Material held by Army Medical Services Museum, Keogh Barracks. Image via Wellcome Images. Letter kept in the war diary kept by Captain Neil Cantlie, RAMC, with the 6th Division at the Battle of the Somme, Sept.–Oct. 1916.